Hindu Educational and Charitable Society has been a torch bearer in the field of education in the region. Hindu Girls College has its genesis in Hindu College Sonepat - a Co-ed Institute which later bifurcated into two independent colleges namely Hindu College and Hindu Girls College keeping in view the need and demand for women's education. The Managing Committee with its futuristic vision started a girls wing near the Railway Station. The foundation stone of the building was laid by Sh. Pratap Singh Kairon, the then chief minister of Joint Punjab. The need for a hostel was felt to cater to the demands of students hailing from nearby villages. At first, the hostel was started in a rented accommodation. 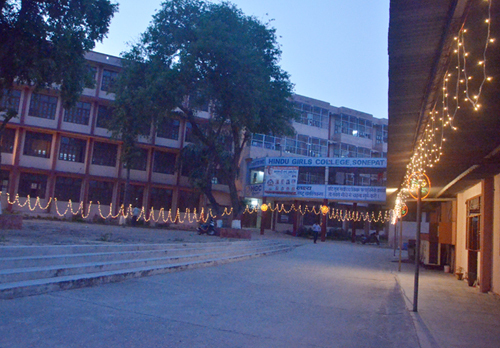 In 1967 the hostel was built in the college premises itself. The hostel today can boast of a new three-storeyed block which is fully equipped with all modern amenities. The hostel can accommodate 450 students. It aims to provide total security and safety to its inmates. * Hostel rooms are airy and furnished. * Cool drinking water facility during summers and solar geyser facility during winters. * Regular water and electricity supply. There is Tubewell and Generator facility to ensure it. * The Hostel mess - its food is regularly checked by student representatives, members of the staff and the Principal herself. * The Hostel Kitchen is fully equipped with modern gadgets and special care is taken about hygiene and nutrition of the food supplied. * Canteen facility in the college. * A tuck shop to cater to day-to-day requirements. There is a P.C.O. in the college premises so that hostelers can contact their parents / guardian. * Fitness point - the Hostel Gym is equipped with modern equipments. * The Hostel common room has recreation facilities like Home Theatre, Indoor Games, News Papers and Magazines. * The Dining Room is equipped with Music System and T.V. * There is a guest room where hostelers can meet their parents / guardians during stipulated timings and days. * The campus is totally pollution free. * A doctor visits the Hostel regularly. In case of emergency, medical facilities are provided in Lala Jai Kishan Hindu Charitable Hospital. * A branch of Canara Bank in the college premises itself where it is mandatory for the students to have an account. * Cultural Programmes and competitions are organised in the hostel from time to time. * A regular Daily Prayer Meeting in the hostel.